Hey everyone, its been almost exactly a year since i discovered this hobby and this website, and its been less then a year since i made my first saber thanks largely to everyones help here. I started small with my first saber, just a simple soundless saber staff with a crystal chamber and some etching (which i realize now i never posted pics of on my original post of my saber...opps). and now im already planning on upping the stakes and making a saber with all (well most) of the bells and whistles. This build probably wont happen for awhile due to the funds and my workload at school (who knew an engineering major was so difficult ? ), anyway i got the itch to make another saber and so i designed my next one. And my hope is that with some help from everyone i can completely fix all the issues and iron out the bugs i didnt think of so my future build will go seemless. 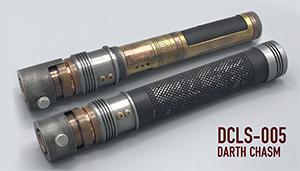 the plan was to make a shroud that was to cover the entire saber from the connection of the pommel past the blade holder, and have the shroud cut to look like Ahsoka Tanos lightsaber. Since my sense of spatial reasoning works better when i can see everything in 3D i decided to make the whole saber in Autodesk inventor because i still had it installed. After several hours of looking all of the store for dimensions of various parts, and moving and "cutting" things where i wanted it I ended up with this. Not to bad if i do say so myself. My original design of a single shroud went away cause i realized that would mean not so easy access to internals so i made it in two pieces right at the double male connection. I also hope to do single bunny ears like ahsoka's as well, I have no clue how i would do that, and if i cant find/do single ears I could compromise and just do the graflex ears. For the internals of this saber im hoping to get a Prizm soundboard and a Tri-cree RGrB LED running off a 18650 battery. So according to the picture/model i should have enough room for this. only thing i am not 100% certain with is how to make those bunny ears, and whether or not i should try for the graflex style ones instead. Anything else anyone sees that maybe a problem with this design that i am missing due to inexperience and tiredness from school/staying up late doing this lol? I like the work you have put in so far. It looks like it will be a good saber once complete. I need to get back in my 3ds max and work on some things myself. Ever since I stumbled across a tutorial on making lightsabers in blender I have been using that. Haven't had much time to do anything lately. For the bunny ears, you could maybe 3D print them. As for the Colour Extender, I'm not sure if/how well it will work with a 3.7V power supply. As well you would need two if you wanted to use them for all three channels, so it's probably just not worth it. wow i never thought of 3d printing them...guess i would just need to figure out how to attach them. So going with good ol' resistors then. would it be resistors that are found using that handy resistor calculator that gets thown around here alot? based off the current each LED needs and the forward voltage? Or does the fact that their connected to a board change that? So since 3D printing was brought up.. and since i dont have a 3D printer (i wish), the only other way i can think of is shapeways, and when i upload my model of the ears i made up there and look at materials costs...aluminum and steel are a bit pricey for just one of the ears... would plastic be strong enough to take drilling and tapping a hole and screwing it on the front like the pictures i have show the ears? I'm not really worried about fighting with this saber (im only one i know with a saber) more so for building this because ,slightly addicted this this hobby now, and the occasional con or showing off to friends. Also if plastic ones ever broke i could always make new plastic ones cause they're alot cheaper. OR if anyone else has suggestions on how to make this kind of bunny ear, or know something that might work that would help too. If plastic doesnt work and i get no other suggestions i could just wait for the graflex bunny ears in the shop i guess.. I'm sure plastic would work if you found the colour you wanted. You'd probably want to secure them with button head screws or something similar. You could also try making them smaller to lower the cost if you wanted to do a metal print. They seem a bit large to me for Ahsoka-type bunny ears. Depends on the thickness of where you put the screw and how big of a screw you use. Why not epoxy? Do you know what the plastic looks like when its finished and are you sure its what you want for an exterior greeble? It has a sandy type texture to it. Even the polished option. Making them smaller wont do much to improve cost.